Cowley Haulage & Civil recently took delivery of three new Renault trucks from Setanta Vehicles Sales in Dublin. Unsurprisingly, Mark Cowley has been delighted with how his new vehicles have been performing. Hailing from the north Dublin village of St. Margaret’s but now living in nearby Ashbourne, Co. Meath, Mark set up Cowley Haulage & Civil just three years ago. By investing in the new trucks, he hopes to improve services for customers and drive operational efficiency. “We are extremely busy at the moment and it’s very much a case of trying to keep all of our customers happy,” he says. The new Renault 460, C380 and K430 take pride of place in the Cowley fleet which is completed by a Hino 410. The trucks, with their silver and blue livery, are always immaculately turned out. The Renaults are fitted with Thompson Muck Master tipper bodies, while the Hino has a Looby tipper body. Mark put the 460 and C380 into operation first, followed by the K430 which only arrived in September. The Renault 460 8x4 unit was the first of its kind to be sold in Ireland and attracted plenty of admirers when it appeared at the Full of the Pipe Show in Cavan this summer. “It’s a mighty machine,” Mark enthuses. “John Farrell, who drives it for us, says he now looks forward to coming to work in the morning! It got a great reaction at the Full of the Pipe. Both the 460 and the C380 are very comfortable to drive and are also very economical. These new trucks have given us an insight into what we’ll need in the future. Mark is also full of praise for his drivers – Kieran Shannon, Declan Redmond and the aforementioned John Farrell. 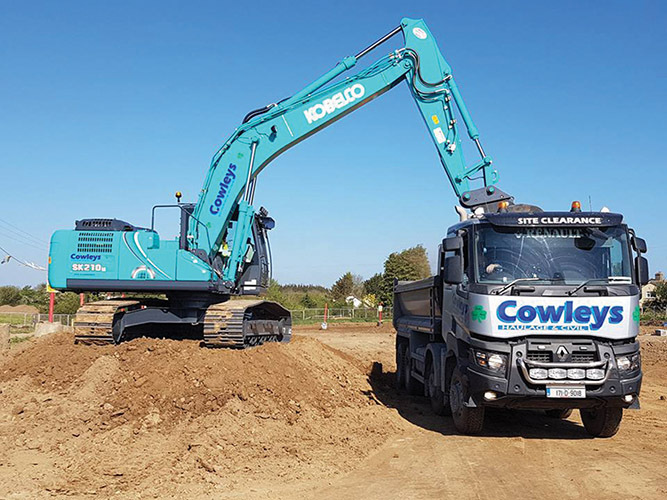 Cowley Haulage & Civil specialise in site clearance as well as the supply of sand, gravel, stone and topsoil. 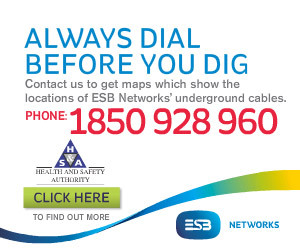 The company holds waste collection permits for all the local authorities in Dublin, Meath, Louth, Cavan and Monaghan and works mainly for construction firms. Cowley Haulage & Civil boasts an impressive client list which includes Moyglare Transport in Kilcock, Co. Kildare, Breffni Group, Sisk Builders, Gowna Construction, Brandon Plant Hire in Trim, Co. Meath, St. Margaret’s Recycling, K&K Packs in The Ward, Co. Dublin and DPS Engineering & Construction in Ashbourne. “Without our customers, we wouldn’t be here. It’s as simple as that,” the affable managing director continues. A much-travelled man, Mark spent seven years working in the haulage and construction sectors in Australia before returning home to set up Daragon Ltd in 2000. The Celtic Tiger was in full swing at the time and the company quickly grew. At its peak, Daragon ran a fleet of 20 Hino trucks. However, the good times didn’t last and Daragon ceased trading following the economic collapse in 2010. Mark then headed to Poland where he worked for two years on road construction working for Sisk and Roadbridge before coming back to Ireland and setting up Cowley Haulage & Civil. And he hasn’t looked back since! Rohan House, St. Margaret’s, Co. Dublin.